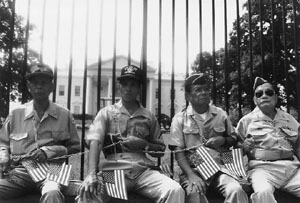 Chain Reaction: Filipino WWII veterans chained themselves in front of the White House last July to protest the delay in benefits. South Vietnamese and Laotian vets have joined them in demands for equal veterans benefits. Filipino soldiers fought in some of the fiercest battles in the Pacific during World War II. And when their American commanders ordered them to surrender to the invading Japanese forces, they endured the infamous "Bataan Death March." Later, many of them took to the hills and waged a guerrilla war. After the war, they were declared ineligible for benefits under the G.I. Bill and other laws. Now more than 50 years later, they are still seeking formal recognition as U.S. veterans as well as the accompanying benefits. South Vietnamese commandos were recruited by the Central Intelligence Agency for sabotage and intelligence missions deep inside North Vietnam. When they were captured, their U.S. officers declared them dead and forgot about them until long after the end of the Vietnam War. They were on the Pentagon payroll and never formally discharged from military service, yet they are not considered U.S. veterans. Laotians and Hmongs are a gentle people, proud of their independence and simple ways. American officers recruited them to fight the Communists and help rescue downed U.S. pilots during the Vietnam War. They were lauded for their bravery, loyalty, and fierce anti-communist spirit. But they too are not considered U.S. veterans and, in fact, could now lose their primary source of sustenance--food stamps. All of these soldiers are Asians. All fought under the U.S. flag. Yet none receives benefits enjoyed by other U.S. veterans. More and more are asking for an explanation. The answer is as complicated as the era in which the United States was at war. World War II was fought more than a half-century ago. Most Americans do not have a recollection of that conflict. The Vietnam War does not conjure happy memories for the American public; it might as well be forgotten. Advocates within the Asian American community say that political expediency, the enormous cost, and public apathy have conspired to push these veteran's issues off of the nation's radar screens. Some say it's a question of fairness that national leaders have yet to fully address. And time is running out. "When we ask someone to stand with us, fight with us under our flag, we should not turn and run away from them when they seek our assistance," said John Mattes, a Miami lawyer who is spearheading the effort to obtain veteran status for former South Vietnamese soldiers. "That is cowardly." A little history helps to clarify the issues. In the case of Filipino veterans, they were inducted into the U.S. Army under a military order issued by President Roosevelt on July 26, 1941. At that time, the Philippine Islands were a colony of the United States. About 120,000 members of the Commonwealth Armed Forces of the Philippines were merged with the 12,000-strong Philippine Scouts and 10,000 U.S. Army regulars to form the first line of defense against the advancing Japanese. Following the Japanese attack on Pearl Harbor, the troops made a stand at Bataan and Corrigidor. The Filipino soldiers, fighting side by side with their U.S. comrades, held off the Japanese for five months, allowing the U.S. to prepare for the defense of Australia and the eastern Pacific. When Bataan and Corrigidor fell in 1942, many of the Filipino soldiers became guerrilla fighters, harassing the Japanese and providing intelligence information to their American officers. Their work helped smooth the return of Gen. Douglas MacArthur to the Philippines to liberate the islands in 1944. In the latter part of 1945, the U.S. Veterans Administration (VA) tried to determine how much it would cost to provide veterans benefits to the Filipino soldiers. The VA administrator at the time, Gen. Omar Bradley, estimated that it would cost the U.S. $3.2 billion to compensate the veterans and eligible family members. Because of the enormous cost, the U.S. Congress decided to pass the Rescission Act of 1946, stating that military service under the Philippine colonial government was not considered active service in the U.S. Armed Forces. The U.S. Congress allocated $200 million for partial benefits, including service-related disability, death, and life insurance. The Filipino veterans were classified under four categories: Regular Philippine Scouts, who enlisted with the U.S. Armed Forces before Oct. 6, 1945; Special Philippine Scouts, whose service began on or after Oct. 6, 1945; and members of the Commonwealth Army of the Philippines. The fourth category recognized guerrillas, who supported U.S. forces from April 1942 to June 1946. In all, nearly 200,000 Filipinos fought under the U.S. flag. About 70,000, now mostly in their 70s and 80s, are still alive, . Only the Regular Philippine Scouts receive the full range of veterans benefits, while those in the other categories receive 50 cents for every dollar authorized in monetary compensation. Patrick Ganio, who heads the Washington, D.C-based American Coalition for Filipino Veterans (ACFV), said Filipinos were singled out for denial of full benefits, while 116,000 alien veterans from 66 foreign countries that fought in the same situation were granted full benefits. "Unless and until the law is rectified to correct the wrong done to Filipino veterans, the claim for equalized benefits remain unresolved," Ganio said. "To the Filipino veterans now in the twilight of their lives, time is running out." A veterans equity bill has been filed in the U.S. Congress since 1989, but none has succeeded in securing benefits for the Filipino veterans. Legislators made an overture by adopting an amendment to the 1990 Immigration Law that allowed about 26,000 Filipino veterans to become U.S. citizens. Although now U.S. citizens, they are still denied benefits available to other U.S. veterans. Ken McKinnon, a spokesman for the Department of Veteran Affairs, said that veteran status is not based on citizenship, but on military service. Since the U.S. Congress declared back in 1946 that service in the Philippine Commonwealth Forces and the guerrilla movement was not considered active service in the U.S. military, Filipinos do not have the status of U.S. veterans, McKinnon said. "We provide benefits to veterans as provided by law," McKinnon added. "We do not make the policies; we implement them." The Filipino Veterans Equity Bill hopes to do just that. Authored by Sen. Daniel Inouye, D-Hawaii, in the U.S. Senate and Rep. Bob Filner, D-Calif., in the House of Representatives, the bill seeks to give Filipino veteran parity with other U.S. veterans. Again, the bill is given slim chance of passage this year. Eric Lachica, executive director of the American Coalition for Filipino Veterans, said 50 senators and 216 representatives must co-sponsor the legislation to ensure its passage. So far, 11 senators and 176 representatives have signed on, but there's a long way to go. "What we're asking for is something we should have gotten back in 1946," Lachica said. "It's about time [the U.S.] comes through with its promises and obligations." Last month brought some good news. The Senate Veterans Affairs Committee voted to provide burial benefits to naturalized Filipino veterans who reside in the United States. Sen. Daniel Akaka, D-Hawaii, who sits on the committee said it was a small but significant concession toward granting the Filipino veterans their due. "Providing full burial benefits to Filipino veterans who fought alongside our men in the Philippine Islands is a small, but symbolic first step toward equity," Akaka said in a prepared statement. Filipino veterans recently opened a new front in their quest to secure full benefits. They filed a lawsuit against the federal government, seeking full benefits and back pay. "You can only sit down and wait for so long," said the veterans' lawyer, William Salica from Los Angeles. "These plaintiffs don't have much time to wait." The suit in Los Angeles Superior Court was filed on behalf of 220 former military personnel all living in the United States. The South Vietnamese commandos have also used the courts and the U.S. Congress to demand compensation and recognition as U.S. veterans. Last year, legislators approved a $20-million compensation package to be paid out to the commandos, each receiving an average of $20,000. Claims are now being processed and could be disbursed before the end of the year, according to Mattes, the commandos' lawyer. About 200 of the estimated 350 commandos who have been identified now live in the United States. But Mattes said he is working toward recognition for former soldiers as U.S. veterans entitled to medical care, housing loans, student loans, job training, and other benefits. He said he has petitioned the Pentagon to classify his clients as U.S. veterans. Failing that, he said he's willing to go to court or to the U.S. Congress to secure the benefits. "These men were on the payroll as combat employees of the United States," Mattes said. "They are eligible to gain veteran status." It was through Mattes' work and that of a former U.S. intelligence officer that the plight of the commandos became known. The CIA and, later, the U.S. Army botched the spy operations in North Vietnam and many of the soldiers were captured after they parachuted behind enemy lines. Recent declassified documents indicate that U.S. officers declared them dead, and their families were provided burial compensation and other benefits. Mattes said that documents recently made public show that the commandos were "killed off " to reduce cost, even though there was evidence the men were being held in Communist prisons. Although the Vietnam War ended in 1975, many of the commandos were still in prison camps until the mid-1980s. Sang Xuan Nguyen, who now lives in San Jose, said they were placed in single cells and shackled. "We were never allowed outside for fear that we would escape," Nguyen said. "It was terrible. The food was not fit for humans." Mattes said it's critical for the commandos to receive medical care, especially now that they are advancing in age. "Medicaid--which the commandos receive--does not address the battle wounds and torture these people suffered," he said. "These men are wounded and need specialized care." That could be achieved by declaring them U.S. veterans, Mattes said. "The evidence is overwhelming," he said. "We have the physical payrolls and the persons who engaged in combat. There can't be a clearer case than that." He said that if the petition, which was sent to the Pentagon in September, is denied, he will go to court to compel the military to recognize the commandos as veterans. "This country could do the right thing," Mattes said, adding that the same treatment could not be done to white POWs or to minority groups other than Asians. "Sometimes, we have to bring out our government kicking and screaming to provide justice." In a sense, the Hmongs and Laotians are doing just that. They are using the courts, with help from the Asian Law Caucus, to keep their food-stamp benefits, which the new welfare reform law has taken away. Under last year's welfare reform act, noncitizens, except those who meet limited exceptions such as veterans, are barred from receiving food stamps. According to Asian Law Caucus attorney Victor Hwang, there is a sense in Congress that Hmongs and other Highland Lao veterans who fought on behalf of the U.S. Armed Forces during the Vietnam conflict should be considered veterans for purposes of continuing certain welfare benefits. About 50 Hmong and Lao veterans whose benefits were terminated earlier this month are testing the language of the law at a municipal court in Marysville, Calif.
"All they're asking is not to be cut off from welfare," Hwang said. "They should be given veteran status. They thought the welfare checks and benefits were money they earned for fighting for the U.S. They said it was OK to send 100 Hmongs to die to save the life of one American soldier. They literally killed themselves to save American lives." According to the 1990 census, there are about 100,000 Hmongs in the United States, with nearly half (43,000) living in California. 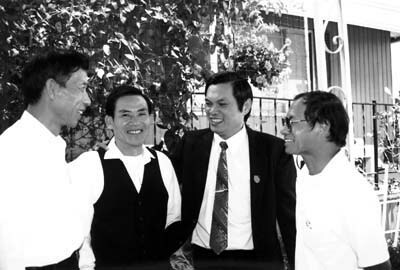 There are about 150,000 Laotians, again mostly in California, particularly Fresno, San Diego, and Sacramento. A mountain people with limited education, about 60 to 70 percent of Hmongs and Laotians are on welfare, according to Hwang, who is representing many of them in appeals to keep their food stamps. "They are some of the most loyal anti-Communists that you can find," Hwang said. "Some say, their only useful skill was killing people. Now that it's peacetime, they don't need that skill--and they have nothing else." Yee Xiong, president of the California Statewide Lao/Hmong Coalition, said his people have suffered long enough. "The Hmong people were targeted for persecution and execution in Laos because of their service on behalf of the CIA," Xiong said. "Many have sacrificed the lives of their parents, brothers, sisters, sons, and daughters on the promise the United States would care for their families. All we ask is to honor that promise." "Lost Commando" Bui Quang Cat shows a photo of himself as a young recruit in American military training in Saigon. 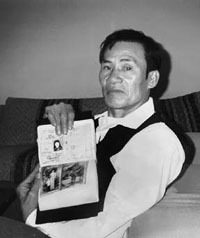 He was captured on a 1966 mission in North Vietnam and spent 17 years in a labor camp. He now lives with his wife and two children in San Jose, Calif.
From 1961 to 1975, the Hmongs and Laotians were recruited and trained to fight the North Vietnamese Army and rescue pilots shot down in Laos and Vietnam. By some accounts, as many as 150,000 fled their country at the end of the war when the Communists took over. They were resettled in Minnesota, Wisconsin, California, and other places. In September, the veterans were honored at a ceremony in Wisconsin for their sacrifices during the Vietnam War. But according to McKinnon, the Department of Veterans Affairs spokesman, the agency has fought against granting veteran status for those who have not served actively in the U.S. military. "You need to show a discharge document from the military service," McKinnon said. "If it's an honorable discharge, then you may be entitled to certain benefits." The benefits include disability compensation, pension, burial benefits, home loan guarantees, small-business loans, hospitalization and health care, and education under the G.I. Bill. Stephen L. Lemons, the acting undersecretary for benefits at the Department of Veterans Affairs, said they have opposed the Filipino Veterans Equity Bill because the current Philippine law for veterans is as comprehensive as that authorized by U.S. laws. "There is no question that Filipino forces, fighting to preserve the independence of their homeland, contributed to the allied victory in the Pacific," Lemons said in a testimony before the Senate Veterans Affairs Committee in July. "However, current law appropriately recognizes our two nations' shared responsibility for their well-being and should not be changed," Lemons said. In addition, he said the health-related components of the bill would cost an estimated $1.6 billion in fiscal 1998 and $7.5 billion over five years. But Filipino veterans advocates say the estimates are inflated. For one thing, only about 70,000 of the veterans are still alive, and less than half of them are U.S. citizens. "What's so unfair is that they are looked upon as less than equal to other American servicemen," said Lachica, the ACFV executive director. He added, however, that the strong opposition from even the Department of Veterans Affairs, which should be an advocate, will not deter them from seeking parity. The decision to provide burial benefits for Filipino veterans in the U.S. is an encouraging sign. "It's a very small concession, but it chips away at the 1946 Rescission Act," Lachica said. "But we're aiming higher. They deserve to get those benefits." But Mattes is less diplomatic. He said racism is the reason why the Asian veterans are not recognized for what they are--U.S. veterans. "It's so easy to turn our backs on people who are not white or Anglos," he said. "Let's be honest, if this happened to white Anglo soldiers, do you think the Pentagon would be as callous?" ©1998 AsianWeek. The information you receive on-line from AsianWeek is protected by the copyright laws of the United States. The copyright laws prohibit any copying, redistributing, retransmitting, or repurposing of any copyright protected material. 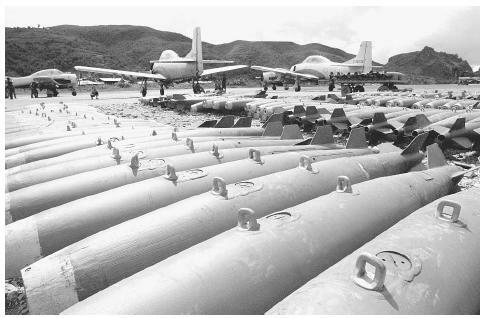 Vietnam War Declassification Project. Gerald R. Ford Library and Museum. http://www.ford.utexas.edu/library/exhibits/vietnam/ (February 5, 2003).